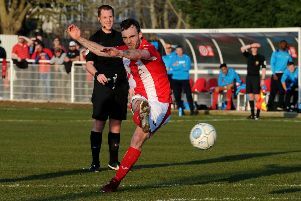 Brackley Town’s poor start to the Vanarama National North League campaign ended in a 4-2 defeat against North Ferriby United. The visitors scored two goals in each half of Saturday’s clash at St James Park where Saints were reduced to ten men again before halftime. Curtis Bateson put North Ferriby two up inside the half hour mark. Bateson fired home in the 22nd minute after Saints three times failed to clear and six minutes later he doubled their lead with a superb individual effort which curled beyond keeper Dan Crane. Sam Whittall reduced the deficit, heading in Stephan Morley’s free-kick in the 33rd minute but Saints then spurned chances to equalise. On the stroke of halftime, Whittall was deemed to have fouled Liam King in the penalty area and receiving his marching orders but King smashed the ensuing spot-kick against the bar. Ferriby increased the lead four minutes after the break when Ryan Kendall netted from close range after Bateson’s shot rebounded off the bar while at the other end Luke Graham’s header hit the woodwork but was cleared. Graham blocked Danny Clarke’s goal-bound effort before Kendall doubled his tally in the 68th minute, poking home after Tom Denton won an aerial battle. David Moyo got one back for Saints in the 79th minute but it was The Villagers who remained in the ascendency to end a run of five successive draws to claim a first away win of the season.